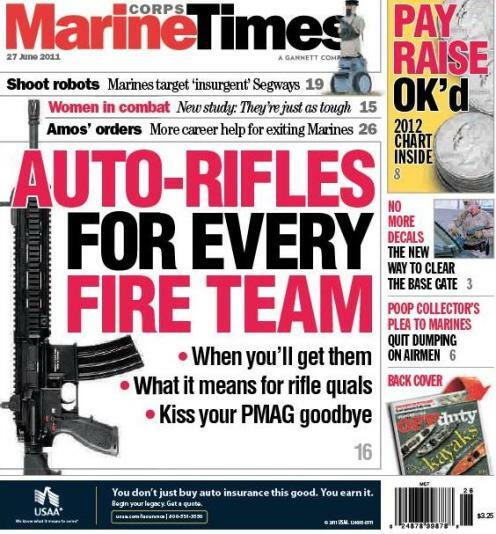 This week’s Marine Corps Times cover story outlines a change that has been debated for at least a decade: Dumping the M249 Squad Automatic Weapon in favor of an infantry automatic rifle. Commandant Gen. Jim Amos recently approved the change, allowing full fielding of the M27 Infantry Automatic Rifle. It’s a possibility that has been widely discussed in the last few years, but we lay out what it will mean for infantry units, rifle qualifications and those snazzy polymer magazines that Marines love, but won’t be able to take downrange anymore. The 5.56mm IAR will become the new standard for automatic riflemen. That means there will be one in virtually every four-man fire team, with three per squad, 28 per infantry company and 4,476 across the Corps. For what it’s worth, senior writer Gina Cavallaro is embedded with 1st Battalion, 3rd Marines, out of Marine Corps Base Hawaii. She has details on how the unit — the first to deploy with the IAR — has adopted the weapon into its operations downrange. Expect to see those in a forthcoming Marine Corps Times, too. Check out this week’s Marine Corps Times on newsstands for more details, or subscribe here online. Awesome, awesome to the max. Finally some branch in America sees the value of the HK416 system. It is a shame that this will replace the SAW. I just hope our Marines are ready to pick up the slack this weapon is going to leave behind. God Bless our Marines who go into combat with this largely ineffective “machine gun”. Woah this weblog is wonderful i love studying your posts. Stay up the good paintings! You already know, a lot of people are looking round for this information, you can help them greatly.